This vibrant tropical plant can be grown as a tree or shrub and can be grown directly in the ground or in a container pot. When grown in a container, it is able to flower all year round, providing it is brought inside during the winter months as it is sensitive to cold. If left outside when temperatures drop below 50° F, the plant will die down to the ground, but it is capable of growing up to 10 feet each growing season, so it soon recovers and rewards you with plenty of vivid flowers once the warmer weather returns. Hibiscus plants are usually grown for the mass of beautiful large flowers they produce in an array of visually striking colors. Each bloom only lasts a day or two before it dies off, but if treated well, the Hibiscus will continue abundant flower production all year-round, resulting in a much-adored plant. The Hibiscus tree is an especially thirsty plant. Most commonly, the Hibiscus is kept outside in a container, as decoration on a front porch or on decks and terraces. When kept in a container outside, you can expect to be watering your Hibiscus around three times a week. During hot summers with long sunny days, you may even need to water your Hibiscus every day. When you water it, thoroughly saturate the soil until water runs out of the drainage holes. Just be sure to empty the drip tray once all of the excess water has run out of the container, as despite being very thirsty plants, Hibiscus do not like to sit in water. To prevent overwatering, ensure that the top layer of soil is dry to the touch before you proceed with watering the plant. If the soil is still fairly moist on top, then it doesn’t need another watering just yet. 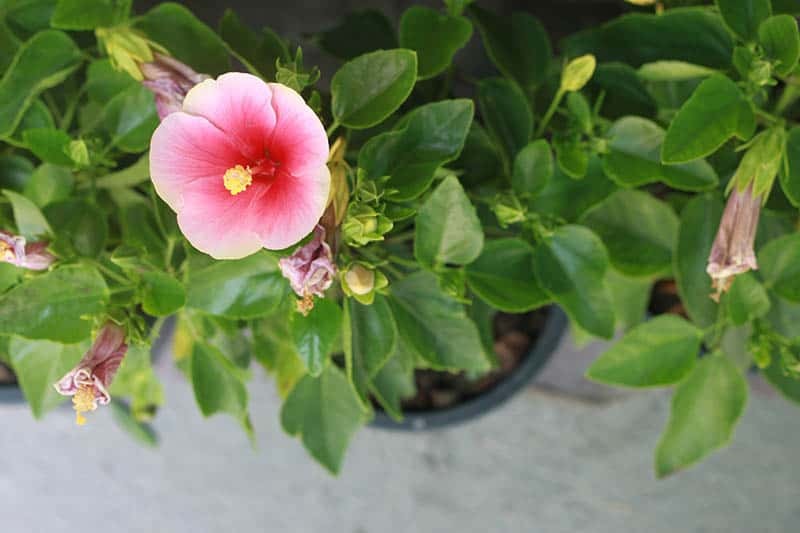 As the Hibiscus likes to drink a lot of water, and will, therefore, be being watered very frequently, it’s important that your plant has good drainage in place to prevent the roots from sitting in water and developing root rot. Use a soil that drains very well, and make sure your container pot has several drainage holes in the bottom for excess water to leak out of. If you’re using a drip tray, keep on top of emptying it to prevent the plant from ever having to sit in stagnant water. This plant enjoys warm temperatures, ideally, between 60 and 80° F. It can tolerate lows of around 50° F but should be brought indoors if temperatures drop any lower than this. The Hibiscus also struggles with exceptionally hot temperatures and will struggle if the thermometer goes over the 90° F mark. It’s common for Hibiscus plants kept in containers to be brought into the house during colder months. If you do this, bring the plant inside before the first frost arrives, as the Hibiscus can be destroyed by frost. 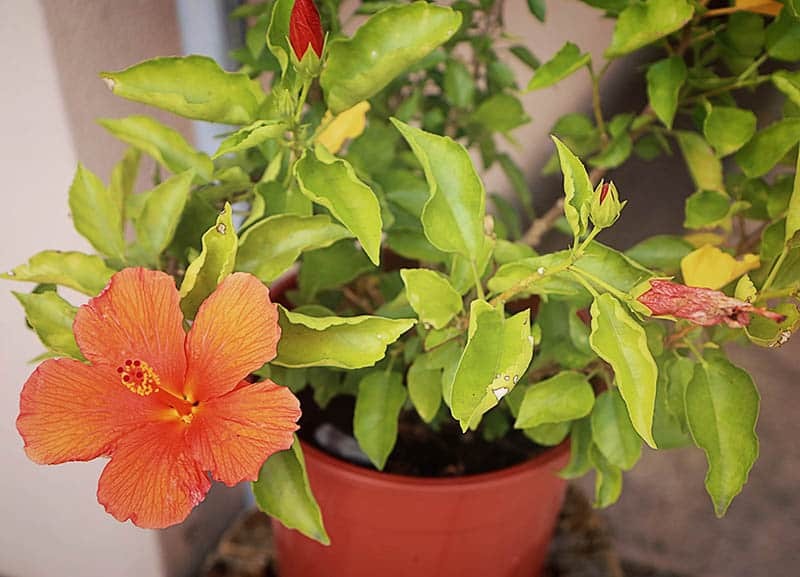 Keep the plant in a warm and sunny spot during fall and winter, and then, move it back outside as soon as overnight temperatures get above 50° F. The Hibiscus doesn’t respond well to sudden temperature changes, so when kept inside, ensure it is away from areas which experience cold drafts, such as entryways. When it’s time for the Hibiscus to return to life outside, you can help it acclimatize by making it a gradual process. Place the plant outside for a few hours each day and then, bring it back inside overnight. Gradually increase the time the plant spends outside over a number of weeks, at which point you can then leave it outside on a full-time basis. 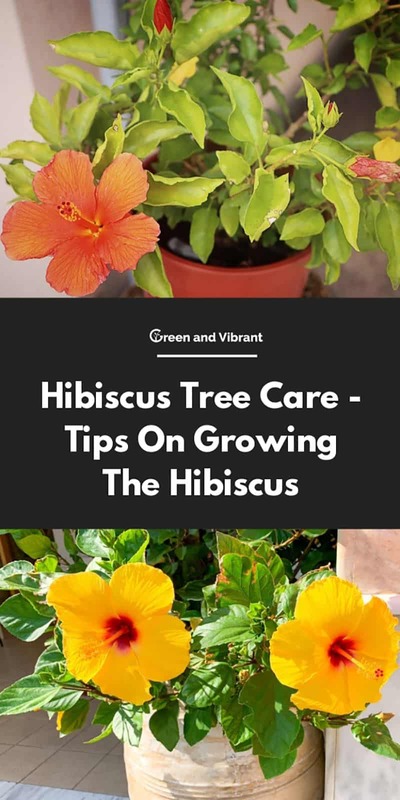 The Hibiscus tree enjoys full sunlight and will need plenty of it if you want it to produce an abundance of flowers (Better Homes and Gardens). When kept outside, ideally, you should situate your Hibiscus in a position which benefits from full sun for the whole length of the day. If this isn’t possible, place it somewhere with the maximum amount of direct sunlight you can achieve for it. If you bring your Hibiscus inside during colder months, it will be happiest sat in a bright and sunny window. When you return the plant outside as the temperatures heat up again, you will need to start off by placing it in partial shade and gradually increasing its time back into full sun. A sudden change from indoor light to full sun outside could cause the plant to react badly and lose leaves, so gradually reintroducing it back into long hours of direct sun will help it to acclimatize and reduce any unnecessary stress and strain on the plant. The Hibiscus does well in moderate to high humidity. If your Hibiscus is living outside, then the humidity is mostly beyond your control. However, if you overwinter your plant inside, then you may wish to implement methods to help increase humidity in your home. You can use an electric humidifier or, alternatively, you can mist your plants with a light water spray every few days. Another option is to sit your plant on a rock tray filled with water; as the water evaporates off of the rocks and pebbles, the humidity around the plant will rise. For a tall Hibiscus, this may not work as well as the other options, as the proximity of the foliage to the pebble tray might not be close enough to have any worthwhile effect. If you do use a pebble tray, always ensure the water level is below the height of the pebbles to prevent any water from entering the plant pots drainage holes. Keeping humidity levels high will not only help your plant to flourish, but it will also discourage spider mite infestations from developing. In order for the Hibiscus to produce an abundant array of blooms, it will need to be fed. 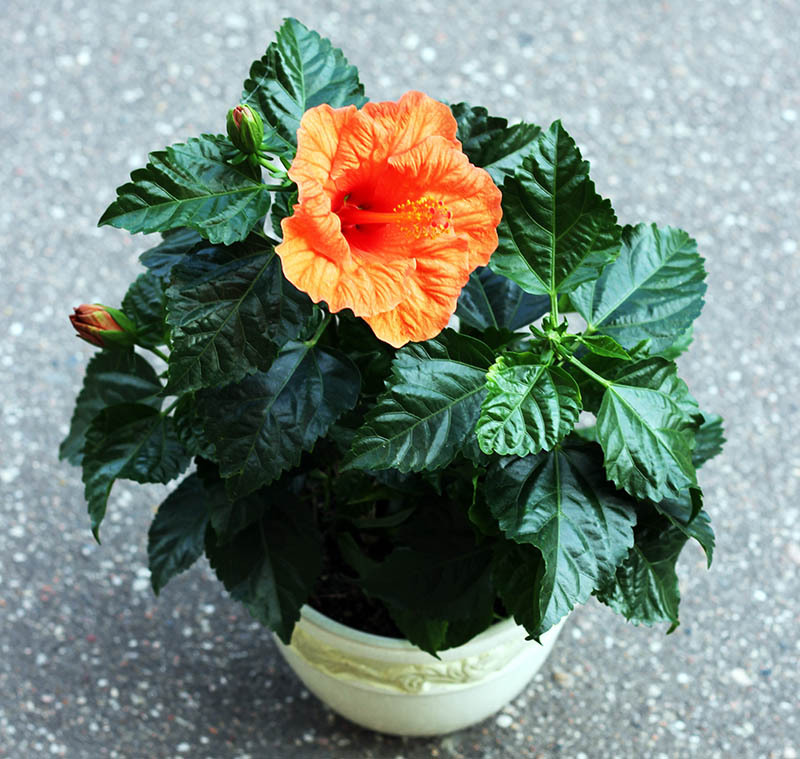 You can use a specific Hibiscus specially formulated fertilizer or a well-balanced fertilizer at half strength. During the spring and summer, you will need to fertilize your Hibiscus regularly. As the plant will be experiencing a high frequency of watering, many of the nutrients in the plant's soil will be getting flushed out the bottom of the container via the drainage holes. To ensure your Hibiscus is getting the nutrition it needs, you can feed it weekly with a water-soluble fertilizer. Using this type of fertilizer will ensure that the minerals get evenly dispersed throughout the soil. If you are fertilizing your Hibiscus frequently but find that it is not producing enough flowers and instead has become very leafy, it is probably a sign that your fertilizer is too high in nitrogen. Nitrogen encourages foliage to thrive, but this is often at the expense of the flowers. Try a different fertilizer with a lower percentage of nitrogen and an increased amount of potassium, which is great for healthy Hibiscus plants. Steer clear of fertilizers high in phosphorus as this can be very damaging to this plant. If it accumulates in the soil, phosphorus can lead to the demise of the Hibiscus. Do not fertilize in the winter (Royal Horticultural Society). Pruning a Hibiscus isn’t essential, but the plant will benefit somewhat from an occasional pruning. If you are trying to maintain a particular shape, then you can do so by lightly cutting back the plant in the necessary places. Pruning the Hibiscus will help to keep it well-balanced, and it will also stimulate new growth. Always prune in early spring as this will encourage flower development and help the plant to thrive throughout the summer. It is best not to prune later on in the season as it can hinder flower production. Dead or damaged leaves and flowers do appear as a normal part of the plant's life cycle. They can look unsightly, so simply remove them when they appear to keep your Hibiscus in its best condition. The Hibiscus does fairly well with cramped roots in a tight pot, so you shouldn’t need to repot it very frequently. However, at some point, you will need to repot the Hibiscus to maintain good health. Check if it is time to repot by lifting up the container and seeing if there are roots escaping out of the drainage holes. If the plant is in a flexible plastic container, you could also squeeze it to get a sense of how root-bound the plant is. If it is bit loose in the pot, then it means the roots still have some growing room. If the pot feels very solid and unable to be pushed inward, then it indicates that the roots are too packed and need some extra space. To repot the plant, you will need to carefully lift it out of its current pot and choose a new pot for it to go in. The size of the pot will be dependent on whether you would like the Hibiscus to grow some more or if you want to maintain its current size. To allow the plant to grow, you will need a new pot one or two inches bigger in height and diameter than the current pot. Fill the bottom few inches of the pot with fresh potting soil and then, place the root ball of the Hibiscus directly into it, padding around the edges and on top with more fresh potting soil. If you would prefer to keep the Hibiscus at its current size, you can repot it back into its current pot. First, gently untangle the bottom of some of the roots, and then, begin cutting them away. You will need to trim off around a third from the root ball, trying to do so evenly. Once you have completed trimming the roots, you can put fresh potting soil into the pot and put the plant back into it. Following repotting, give the plant a thorough watering and then put it in the shade for a few days to allow it to recover. Once the plant has had a chance to get used to its new pot, you can move it back to its usual position in full sun. Repotting in spring is preferential, but repotting in summer can also work. Never repot during winter as the Hibiscus May struggle to recover. When choosing a pot for your Hibiscus, a good tip is to use a stone pot as this will help your plant to thrive. Clay pots can turn the soil alkaline over time, which causes problems for this plant. The easiest and most successful method of propagating a Hibiscus is with stem cuttings. You will need to identify an immature branch on the mother plant, which should still be slightly soft and have some leaves on it. Prune it from the mother plant, ensuring you have a stem cutting of at least four inches in length. Pot the stem into a growing medium, first dipping the cut end in rooting hormone if you wish. Keep the cutting moist and cover it over to increase humidity and create a greenhouse effect. You can use a glass jar turned upside down or improvise with a plastic bag. When new growth begins to show on the external part of the cutting, it means that roots will have formed at the other end. Once this happens, you can transfer it to a new pot and continue care as usual. Propagating like this will result in a new plant identical to the mother plant. Seed propagation is also possible but somewhat less successful than using stem cuttings. To propagate with seeds, simply place them in soil and then add more soil over the top. Keep the soil moist and wait for seedlings to appear, which should be in approximately four weeks. Some, though not all, species of Hibiscus are poisonous to pets. The hardy Hibiscus, Rose of Sharon, is named as one of the poisonous species if ingested by your cat or dog. Symptoms usually occur after nibbling on the flowers rather than the leaves and include gastrointestinal effects such as vomiting, diarrhea, and lack of appetite. As a result of this, your pet may become dehydrated and need professional help from a vet, but the overall effects of ingesting the Hibiscus plant are usually mild and not life-threatening. Serious poisoning would only occur when a pet eats a large amount of the plant at once, so nibbling on the plant occasionally should cause no more than a mild tummy upset. Conversely, some species of Hibiscus are edible when eaten by humans. Their leaves have been used similarly to spinach or kale in some parts of the world, and some flowers are also edible (University of Arkansas- Division of Agriculture Research and Extension). More commonly known is Hibiscus tea, which is infused with dried flowers from the species Hibiscus sabdariffa. If your Hibiscus has yellow leaves over winter while it is being kept inside, the likely culprit is overwatering. Removing the yellow leaves and adjusting your watering routine should resolve the issue. Although the Hibiscus is a thirsty plant, it requires much less water during fall and winter when the growth slows down or ceases almost entirely. During this time, you should dramatically cut back your watering to avoid problems. Yellowing leaves are the sign of a problem with your plant’s care and should not be ignored. Address your yellowed leaves quickly to prevent root rot from setting in. A lack of blooms on your Hibiscus could be down to a number of things. The Hibiscus plant is very easy to care for, but only if you get its conditions just right. In order to bloom, the plant will need plenty of sunshine. Outside, it will need at least four hours of direct sunlight each day, ideally more. If your Hibiscus is in a pot, you should try moving it to a more appropriate location where it can get more sun. The Hibiscus is also a ‘long day’ plant, meaning it needs to have light- direct or indirect- for 14 hours a day. It’s common for a Hibiscus not to be able to achieve this when it is housed inside for winter. If your Hibiscus is in a room where the lights get turned off in the evening, leaving the plant in the darkness for too long each night, then you need to find a way get light to the plant. The best solution would be to buy a plant light and set it on a timer so that the Hibiscus gets the few extra hours of light it needs each evening. If this article has helped you care for your Hibiscus, leave us a comment or share it with your friends!